As the snow finally turns to rain we welcome the chance to see and hear the sights and sounds of spring again! One of the most best signs that spring has arrived is the beautiful sound of busy little birds chirping outside your windows. 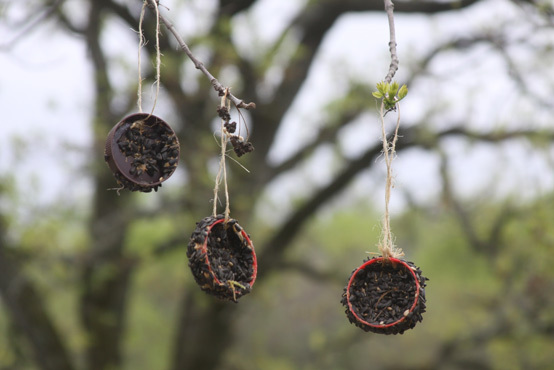 Here is an easy projects for the kids and well… it’s for the birds too! 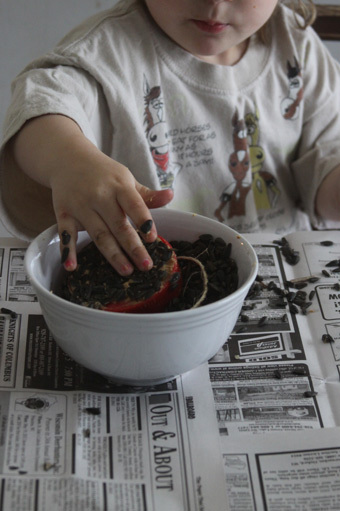 Get the kids in on the fun, and let them help the birds celebrate spring. A few quick supplies and some old jar lids is all you will need to create some sweet little bird treats with your kids. 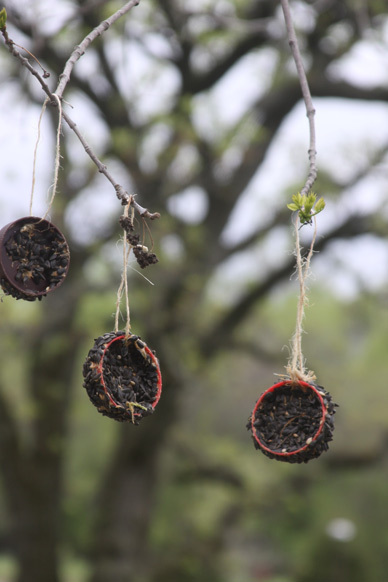 Not only is this a fun activity and easy project to make – The thrill of watching, waiting, and seeing the birds that enjoy the treat they created will evoke some awesome smiles from your kiddos! This was a super easy but delightful project that the kids and I did last spring to welcome the new season! My kids love watching the birds out on the porch while they eat their morning oatmeal, and are always trying to “catch” them in the yard. It’s no surprise that the kids are amused and enthralled by everything that those sweet, chubby little birdies are doing. For that reason I wanted to come up with a project that the kids could do that celebrated the arrival of all of their little feathered friends after winter’s end. This is a pretty self explanatory project, and one that you can throw together with things that you have around the house. To start we used old peanut butter jar lids that I had saved for the project. Use whatever kind of lids you have that will hold up to a little bird beak pecking at it. Because the lids were pretty thick I had to poke a hole through the top with a hammer and a nail to have a place to hang it from. I suppose I could have just used hot glue, but I wanted to make sure the tie would hold if a bird landed on it. After creating a hole I added a strong piece of twine to hang the bird treat in a tree with. The rest was up to the kiddos. They got to work covering the jar lid in Natural peanut butter. They each had their own dish of peanut butter to spread and they used little plastic play dough knives to spread the peanut butter over the lid. They needed a little help getting the inside corners covered, but nothing we couldn’t fix. 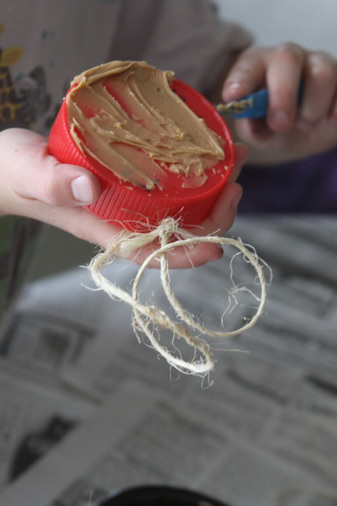 The next step was to roll the peanut butter covered lid into some birdseed to create a treat that any bird would love. The kids really enjoyed dipping the lids into the seed and seeing how many seeds they could get to stick into the peanut butter. I have heard that things like cheerios and non sugary cereals are also a treat that birds enjoy. Use what you have, but do a little research to be sure what you put out is safe for the birds to eat! The last step was to take the pretty little bird treats and hang them outside for the birds to enjoy. We chose a spot out near out deck that the kids could see from the dinning room table. That way the kids could watch and enjoy the birds coming and going from their spots at the dinning room table. If you want to take it a step farther check out this great Kid’s Binocular Craft that I shared with you last summer! You could have the kids create their very own binoculars from toilet paper rolls to make their bird watching experience even more fun! 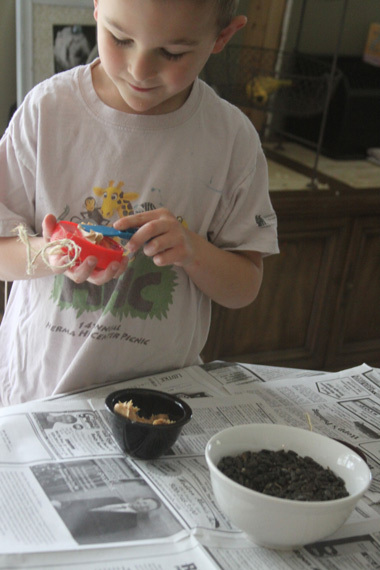 These little bird feeders were so fun and easy and the kids had a blast watching to see what kind of birds stopped by to enjoy the treat they had made! They spent the next few days peering out the window and “keeping an eye” on their bird treats.